This Tuesday, I was honored to be selected as the pro-legalization side in the first-ever public debate on marijuana legalization at Texas Christian University. Opposing me was Ben Cort, a board member of Project SAM, the nation’s anti-legalization lobby. 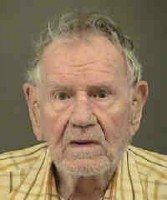 A 94-year-old man has been charged with felony possession of marijuana, according to the Mecklenburg County Sheriff’s Office. Douglas Floyd Ponischil was arrested early Monday, records indicate. Ponischil does not appear to have a lengthy criminal history in the state. A background check revealed only minor traffic violations. Here’s the arrest, in case Ben Cort’s reading. Tax money was used to catch a 94-year-old marijuana consumer. I’m sure the people of Charlotte, North Carolina, are all resting safer knowing this veteran was taken into custody. I contacted the reporter, Elisabeth Arriero, by e-mail. She didn’t give me any more information, and said she was not planning a follow-up story. The lack of details of this incident are maddening. I also called N.C. NORML, but only got an answering system. I left them the basic info on the recording. That’s North Carolina. It was one of the states in the 1970’s (when Douglas was merely in his fifties) that decriminalized personal possession of marijuana. Yup, for about forty years, possession of less than a half ounce is a non-arrestable misdemeanor with a $200 fine. Problem is, you can be arrested for more than half an ounce and as Adela Wisdom notes, over 1.5 ounces is a felony. Project SAM wants to maintain a penalty of some sort against personal adult use of marijuana, but reduce the consequences to the majority of adult users to just below the level of outrageous headlines and depressing statistics. Things like the US leading the world in incarceration, college kids losing scholarships, innocent people and their dogs getting shot, racially disproportionate arrest statistics, and yes, 94-year-old men being led off in handcuffs for having too much marijuana.